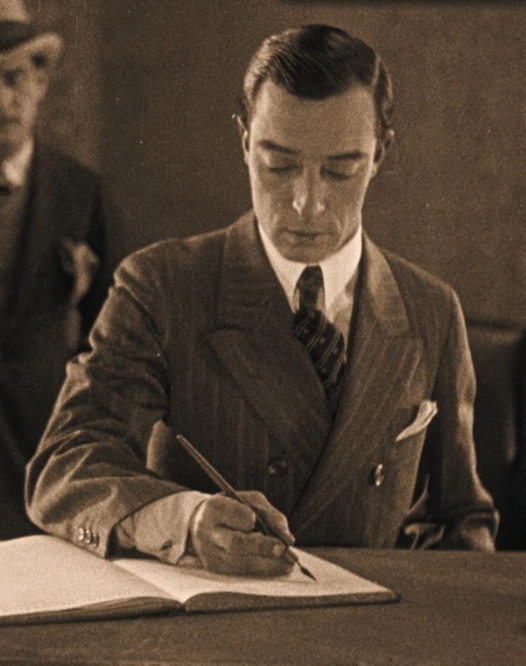 The 2018 San Francisco Silent Film Festival closes Sunday, June 3 with a screening of Buster Keaton’s self-directed comedy Battling Butler (1926), hosted by Leonard Maltin, and honoring recently deceased festival Board member, beloved television writer and director Frank Buxton, who among his many accomplishments once worked on stage with Keaton himself. Above, early in the film Keaton used the front entrance of the Talmadge Apartments, owned by his sister-in-law actress Norma Talmadge, and married to Buster’s boss Joe Schenck, to portray Keaton’s family mansion. Buster plays an effete millionaire who seeks to impress a girl (played by Sally O’Neil) by allowing her to mistakenly believe he is a champion boxer sharing the same name. 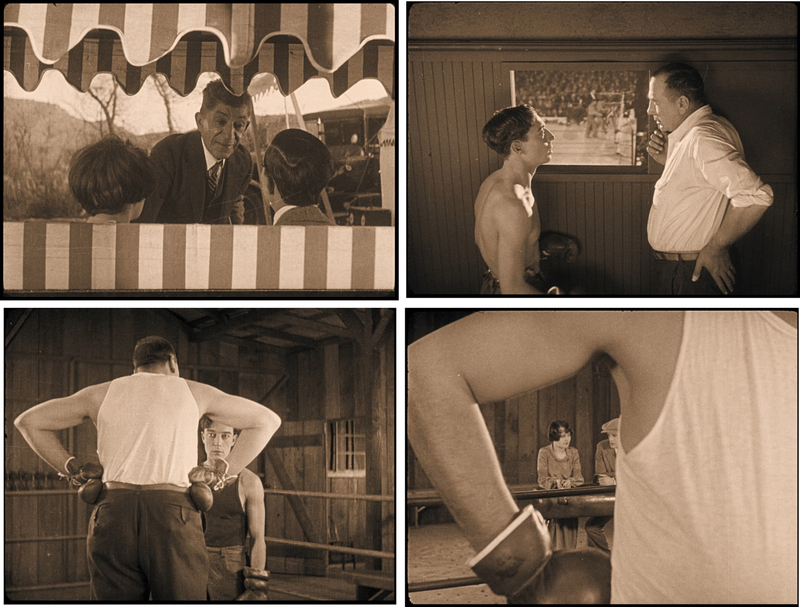 As might be guessed, the movie ends when amateur Buster, spurred by love and honor, defeats the pro boxer in a fight and wins the girl’s heart. As explained in my book Silent Echoes, Sally’s hometown scenes were filmed in old Kernville, a small town in the Kern County foothills later submerged by the Lake Isabella Dam completed in 1954. Above, Keaton’s welcoming crew march toward the Mountain House Inn (where Keaton and crew stayed during filming), now submerged under Lake Isabella – California State Library. Click to enlarge. 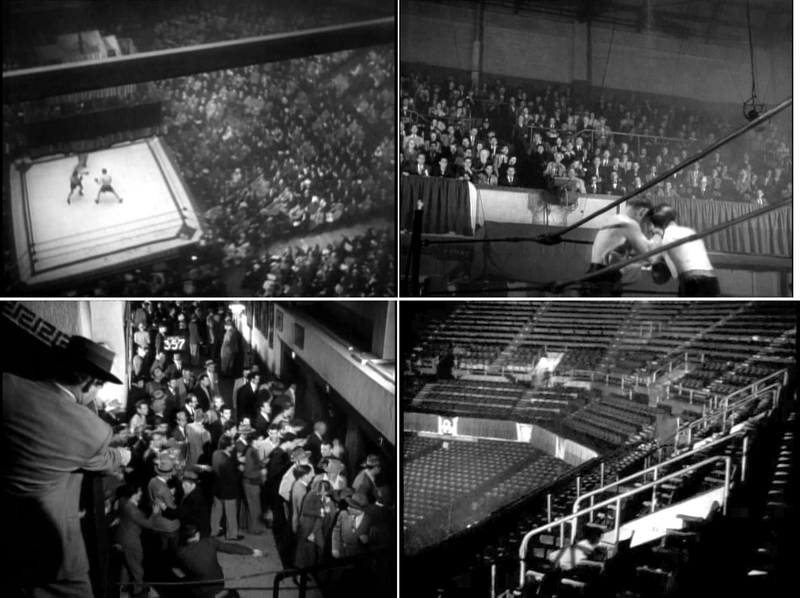 The extant Olympic Auditorium appearing in Keaton’s Battling Butler and in the Three Stooges’ Punch Drunks (1934). 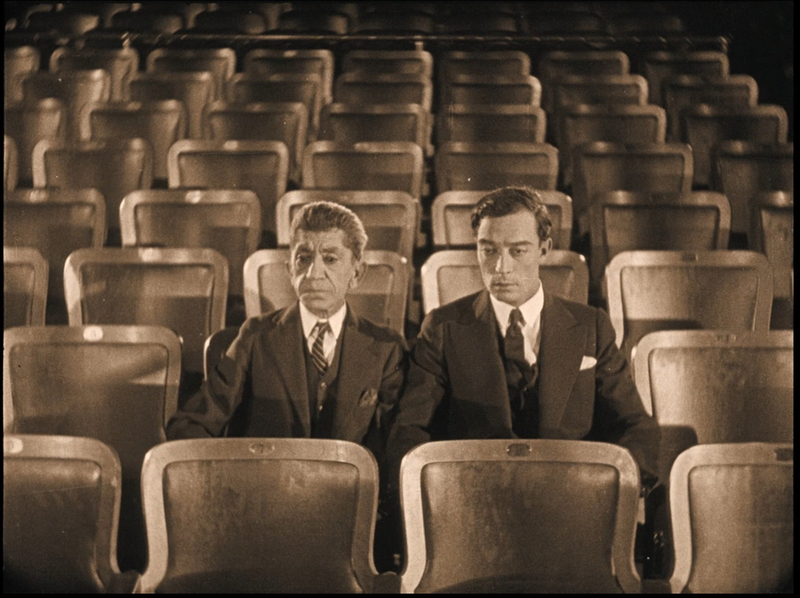 Key scenes took place in the newly opened Olympic Auditorium, still standing at 18th and Grand in downtown Los Angeles. Construction began on January 10, 1925, with world champion fighter Jack Dempsey on hand for the ceremonies, breaking ground with a steam shovel. Dempsey returned when the completed arena opened August 5, 1925, and was presented with a solid gold lifetime ticket, the size of a calling card, good for all future events at the venue. 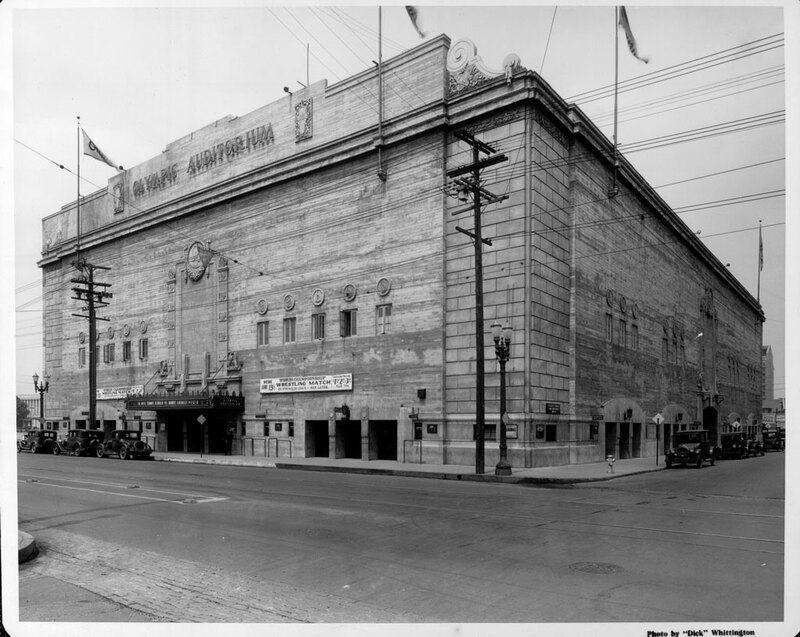 The so-called “Punch Palace” was built in preparation for the 1932 Los Angeles Olympic Games, and was the largest arena of its kind west of New York City, reportedly seating up to 15,300. The boxing and wrestling hall could be converted to host other programs, and the California Grand Opera Company performed there during October 1925. 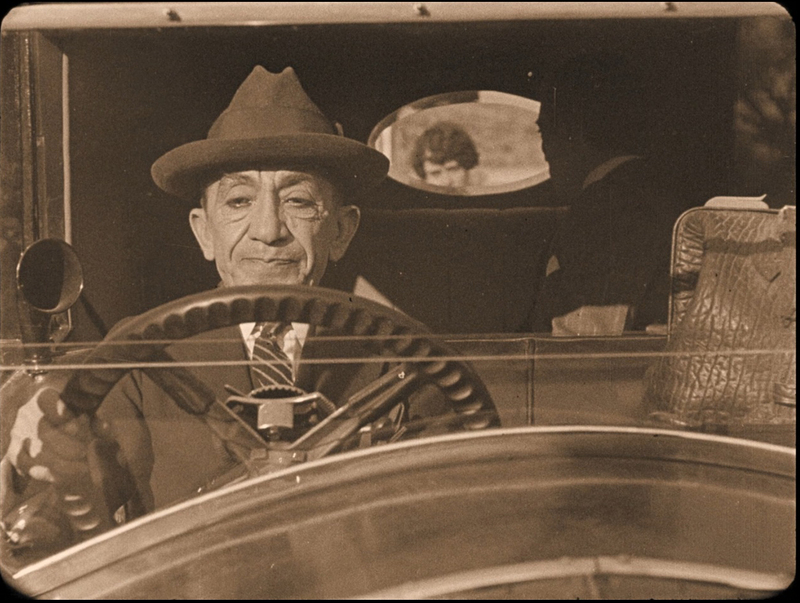 Buster and his valet, played by Snitz Edwards, sit stunned after witnessing a formerly obscure boxer who shares Keaton’s name unexpectedly win a championship bout. Because Buster started working on Battling Butler only months after the arena first opened, its role in the movie could be its debut appearance on film. 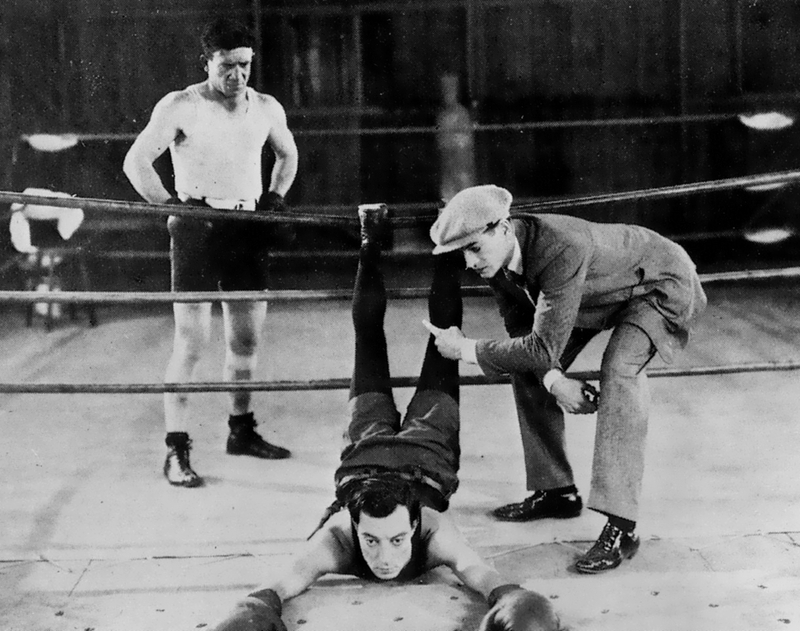 Aside from appearing with the Three Stooges in Punch Drunks, the arena has been used as a location for classic films such as Rocky (1976) and Million Dollar Baby (2004). You can find my five other posts about Buster and the Stooges HERE. Remarkably, the William Holden film noir drama The Turning Point (1952) has strong connections to all three leading silent comedy stars. The movie not only makes great use of the arena where Buster filmed (see below), it also shares noir locations on Bunker Hill with Harold Lloyd’s 1924 feature Hot Water, and in the gas tank district with Charlie Chaplin’s 1936 comedy Modern Times. Battling Butler concludes with Buster, decked out in boxing shorts and a silk top hat, strolling down a city boulevard at night with Sally on his arm, oblivious to the curious onlookers surrounding them. Click to enlarge. The Biltmore Hotel, designed by Schultze & Weaver in 1922, is located on Olive Street facing Pershing Square. Keaton strolled from the corner of 5th and Olive, with the San Carlos Hotel across 5th Street, which bears a “STEAMSHIP TICKETS” sign (oval) in each image. UCLA Libraries – Digital Collection. Unlike Buster’s contemporary Harold Lloyd, Keaton seldom filmed in the downtown Los Angeles Historic Core, and locating this concluding shot eluded me for years. But once I determined that Harold had used the Olive Street entrance of the classic Los Angeles Biltmore Hotel for scenes from For Heaven’s Sake, I realized Keaton had filmed here too. The Biltmore has appeared in dozens of films. Although perhaps less celebrated than other Keaton works, I’ve always found Battling Butler to be quite charming. 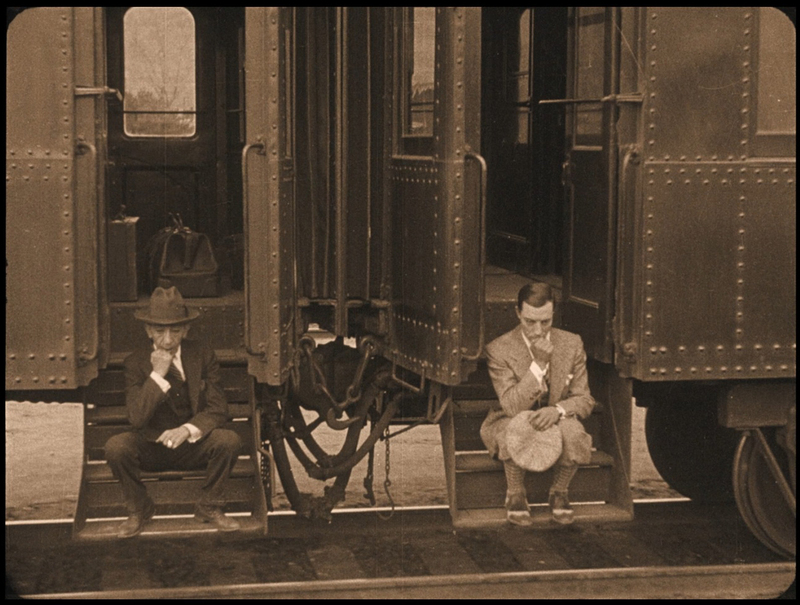 The film contains many thoughtfully composed scenes, such as Buster’s fiancé framed through the rear window of his limousine, receding into the distance as Buster drives away (left), and a tracking shot of Buster and Snitz, lost in thought, sitting on the steps of a moving passenger train (right). A final remark, Battling Butler also contains a clear image of Buster’s injured right index finger during a scene where he registers at a hotel. Buster trapped his finger in a clothes mangler as a young child, and had to have the tip amputated. 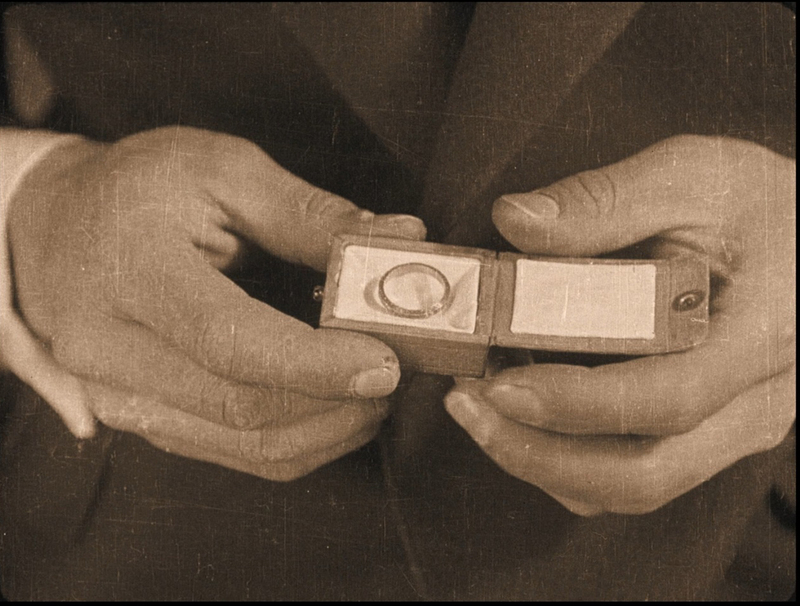 This shot to the right, of “Buster” holding an engagement ring, was filmed using a hand double. It is a strange coincidence that both Buster and Harold Lloyd had injured right hands and employed hand doubles in their films. The screening of Battling Butler will feature a new restoration by Cineteca di Bologna in collaboration with Cohen Collection, with the event sponsored by McRoskey Mattress Company, and copresented by the California Film Institute, the Exploratorium, and the Niles Essanay Silent Film Museum. Battling Butler (C) 1926 Metro-Goldwyn-Mayer Corporation. (C) renewed 1954 Loew’s, Inc. Punch Drunks copyright Columbia Pictures Industries, Inc. The Turning Point (C) Paramount Pictures Corporation. Today the Olympic Auditorium is home to a church. This entry was posted in Buster Keaton, Film Noir, The Turning Point, Three Stooges and tagged Battling Butler, Boxing, Buster Keaton, film noir, film noir locations, Los Angeles Historic Core, Olympic Auditorium, Punch Drunks, San Francisco Silent Film Festival, Silent Comedians, Silent Comedies, Silent Movie Locations, Talmadge Apartments, The Turning Point, then and now, Three Stooges. Bookmark the permalink. Very interesting and well constructed, as usual. Great detective work, as always. Nice work, John. Another great archeological dig into the early days of cinema. Well done! Thanks Thomas – I hope to see you there. Love that thanks to the power of HD you can see where they tried to cover up the name of the Talmadge Apartments in Battling Butler. Congratulations on yet another forensically detailed post, John. Keep up the great work! Thanks Brent – the HD silent titles are really a treat. I enjoy your blog post very much. I love the silent film festival and go every year. I have copies of your three books and would like to get them signed by you. Are you doing a book signing at the festival? Thanks.